The small and large can EPC solenoid types for GM and Saturn units cannot be interchanged, or shift complaints will occur. Reference the ID guide to verify correct valve body. 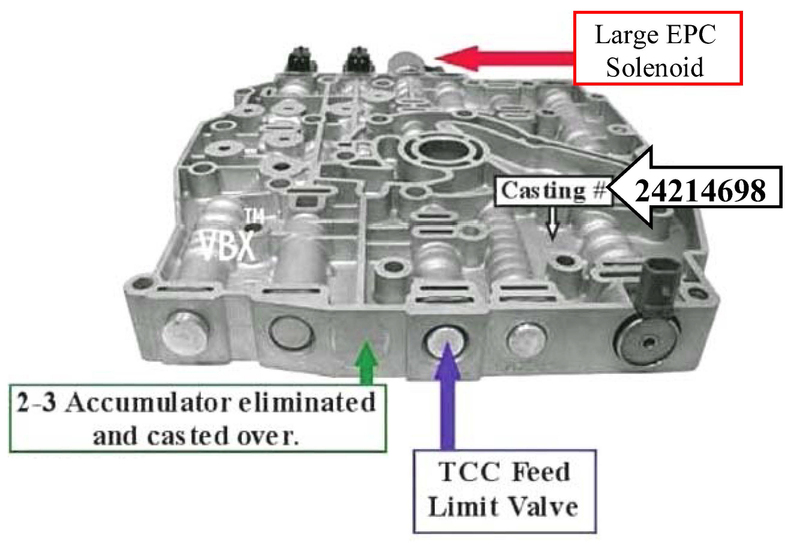 The most efficient way to identify this valve body is by the casting number. In addition, we have illustrated below some more detailed information to aid in the valve body identification process. Has 2-3 accumulator valve, spring & end plug. There are 6 oil feed holes for pressure switch manifold. NO 2-3 accumulator valve, spring or end plug. Bore is casted over where 2-3 accumulator was. There are 3 oil feed holes for pressure switch manifold. TCC feed limit valve eliminated. Worm tracks are slightly different. Saturn L-Series vehicles with 4T40-E/4T45-E transmissions began using a small diameter Bosch solenoid in 2003 models. 2000-2002 Saturn L-Series vehicles with this transmission will have a Delphi large diameter solenoid. General Motors followed suit and made the change to the small diameter Bosch solenoid in 2004 and up 4T40-E/4T45-E applications. 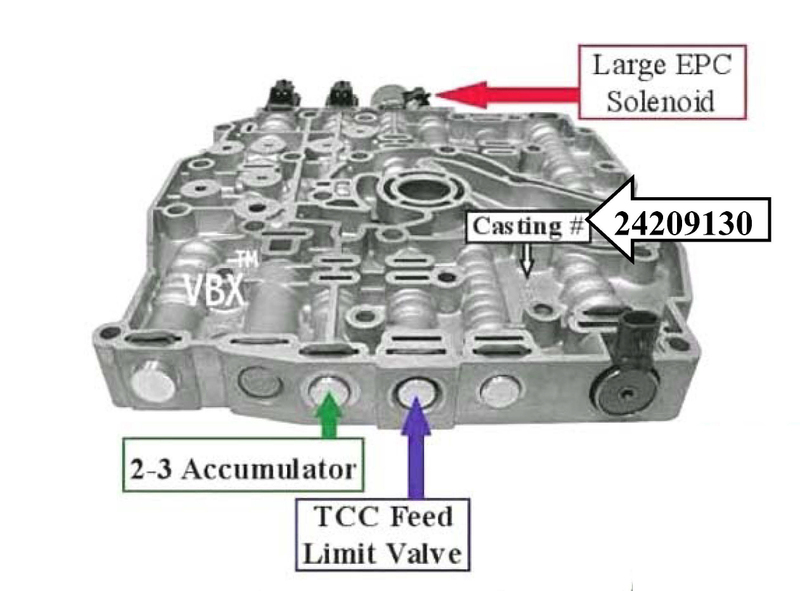 Both solenoids will physically fit into the EPC bore on the valve body and both solenoids have the same electrical connector so they will both connect to the harness, however, installing the wrong solenoid will adversely affect the shift quality and may not set a trouble code. Installing a Bosch EPC into 2000-2002 vehicles will cause harsh shifts that may not adapt out. Installing a Delphi EPC into '03-later vehicles will cause soft/slipping shifts & and may or may not set a trouble code. Currently part number GM061 for the '02-'03 4T40E/4T45E valve body is fitted with the Delphi EPC for GM vehicles. If you have a 2003 Saturn that needs the Bosch EPC it will need to be an R&R special order.